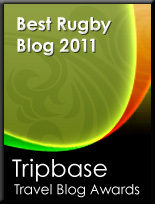 TOTAL FLANKER...a rugby blog: Hee hee! Three men are stranded on a desert island in shark-infested waters. The first decides to risk the half-mile swim to land, but fails to make it. The second also meets a grim and bloody end. The third dives into the water and, without being touched, makes it to the mainland where he strolls into the nearest beach bar and orders a beer. "How come you made it and the others didn't?" asks the barman. "That's easy," replies the dripping stranger. "I wore a T-shirt saying 'Francis Baron is a genius' and even the sharks wouldn't swallow that."